I recently had my 4 year coaching anniversary a couple months ago, and then passed my 5 year member anniversary last week. Right in between those two points fell my 34th birthday, and the mark of a decade here in San Diego. Yes. 34. I’m sure you’re all extremely shocked to find out I’m not 24, and not from here. Surfing and Yoga really are miracle drugs. All three of these affected me slightly different this year than last, as I’m sure makes complete sense, considering the passing of time seems to be exponentially faster and more significant the older I get. All three of these also set me on what feels like endless reflection for the last few months. I say it all the time, this gym has changed who I am and how I view life in so many significant ways. It has shaped me literally in physical form, forced me to look at some of my own storylines about myself and choose if that ink is permanent, and it has given me a purpose I wasn’t sure existed outside of teaching yoga. 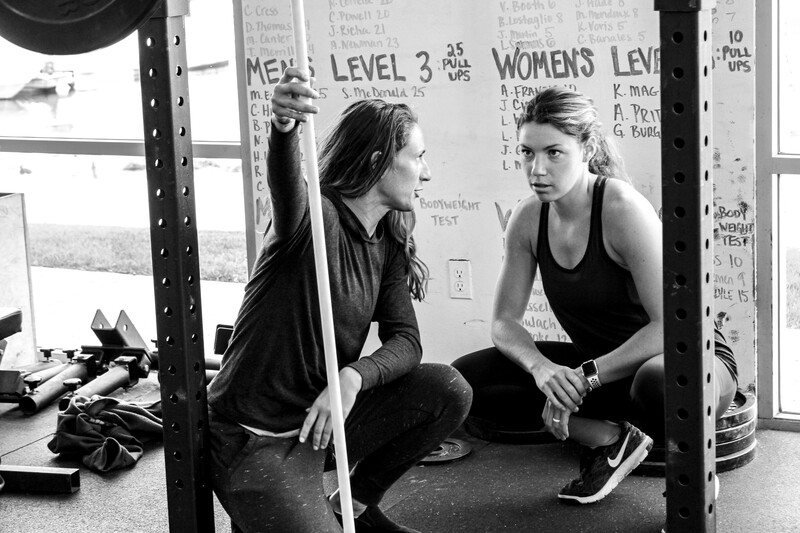 Often times when reflecting on the ways coaching and being a member here have changed me, I feel a great surge of gratitude toward the massive, and very wonderful female population that we have at P360. As I’m sure this fact will also come as a great shock to everyone, I am the only girl in my entire generation of my family. I have a ton of older brothers and boy cousins, and my mother (bless her that sweet angel) was much more of a tomboy herself. Growing up, I just didn’t have a lot of girls my age that I spent time with. This made for a pretty awkward high school experience (I literally would hide from everyone in the locker room because this was what I was used to as a child) where I gravitated toward making friends with the guys, and had a handful of girlfriends that were also “guys’ girls” (a term I have grown to loathe). So where a lot of people in my life have made the assumption that I just don’t like girls that much, the truth has always been that I felt inadequate, did not fit in, and had zero clue how to naturally connect with girls as a product of my environment. You might think that teaching yoga would be like stepping into the world of women where we talk about being goddesses and whatever misconception there might be about all of that, but there was another place I was able to keep mostly to myself outside of the front desk pleasantries. Oh and when you teach yoga, you’re the only one talking, so it is not a two way street of getting to know one another. Fast forward to joining Performance360. Especially back in 2013, where the genders did not share equipment much, the room was split and I was scared. I was about to be very exposed in this weakness of practicing female connection beyond my close friends. I was also trying to physically perform tasks that were completely foreign to me, feeling like a total loser, and again, inadequate because the women here be strong. Really strong. Which I definitely was not. So let’s throw our old friend “intimidated by everything and everyone” into the mix too. I remember so clearly my first class. Rachel Gaz. My savior. She immediately introduced herself and basically invited me to follow her around like a puppy dog the entire class to follow along. Angel. I was at ease before I knew it, and realized that I was only interacting with women the entire time I was there. This was a huge step for me, and I was very excited. Before long, I was the one introducing myself to girls at barbells, and asking to be partners, and wanting to be friends outside the gym too. I was getting digits, making gym dates, and finding my very own #gymwife. I found myself more confident in the idea of who I was as a woman getting stronger in the gym, less afraid. Through the last five years, I have been able to let a part of myself that was never comfortable, gradually become more relaxed and open to connection with people I may not outwardly seem to have common ground with. Because of the extremely friendly, inquisitive, supportive, and ultimately strong community of women at P360, I have built some of the best relationships of my life in and outside of these walls, and allowed change to happen in the most unexpected way. In teams of 3, complete the following in order. Total Reps for the team.